At the close of the Civil War, former slaves seeking protection and freedom left the plantations for Union troop encampments. Following the departure of Union soldiers, many of the now-freed slaves remained behind and settled in an area named Freedom Hill. Freedom Hill was incorporated in 1885 in Edgecombe County. The name was changed to Princeville in honor of Turner Prince, an African-American man who had been involved in building many of the community’s homes. 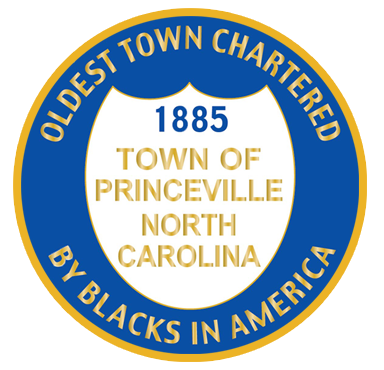 Historically, the Town of Princeville has been populated primarily by African-Americans and struggled early-on with social and economic difficulties relating to racism. Over time, the citizens of Princeville have developed a strong sense of pride in their history and in their community and the Town stands as a symbol of African-American determination and endurance. The Town of Princeville sits adjacent to the Tar River and, due to the elevation, has flooded many times over the years. Between the years of 1800 and 1958 the Tar River flooded the area seven times. In 1965, the Princeville Dike was built by the Army Corps of Engineers. In 1999, heavy rains from Hurricane Floyd flooded the area, caused the dike to fail and, once again, the Town was submerged. In some areas of Princeville, water rose 23 feet above the streets and it took ten days for the waters to completely recede. Princeville was declared a National Disaster Area and many people, including President Clinton, Jesse Jackson, and Al Sharpton, visited the area to provide moral support. The singer Prince donated $37,000 to the town to assist with disaster relief. Before Hurricane Floyd, the rest of the state and the nation knew little about Princeville and its legacy. The drama of the flood changed that; everybody seems to be asking about the old black town now. The students — and a few professors — were part of a research team from North Carolina Central University in Durham that visited Princeville one year after the flood. NCCU’s history department just began a multi-year project to collect oral histories in Princeville and to assist the town’s preservation efforts. The first stage of the project led us to the old cemetery. Grass had to be mowed, leaves and debris needed to be raked, and trash had to be collected. Most of the students knew hardly anything about the historic town save what they gleaned from media reports. Although they knew that this was one of the oldest towns established by blacks in the country, they did not seem to realize that the community was founded by ex-slaves after the Civil War. For some reason, it was difficult for them to make the connection to that period. If this place was so important to history, then why was the cemetery in such disarray? Where were the ornate monuments and bold signs commemorating that dignified past? This day spent in the cemetery forced them to consider what conditions might have been like during slavery and at the moment of emancipation. Cemeteries always have stories to tell. They speak the names of ancestors and rescue the past from obscurity. Black folk — especially those in the rural South — seem to cherish these sacred places; they not only reconnect people with their pasts, but they also bond residents with the land. And for many African Americans in the South, that land is sacred ground, because our ancestors worked the soil in slavery and in freedom. But what lessons could be learned from the community of the dead in Princeville? The historic town in Edgecombe County is still recovering from the devastating flood of 1999. Residents are slowly returning to their homes but, to a group of about fifty drowsy-eyed college students on a Sunday morning late this summer, the town’s oldest cemetery appeared to be forgotten. Tall grasses blocked the tombstones from the view of passers-by on the road. Some grave markers had fallen like dominoes. And the threat of being cut by briars or bitten by snakes loomed large. Princeville was incorporated in 1885, but its history as an independent black community predates that. At the end of the Civil War, Union troops occupied the Tarboro area. By that time many slaves had fled the nearby plantations and come to the military zone in search of a new life in freedom. In 1865 some of these refugees settled in the swampy flood plain across the Tar River south of Tarboro, on the property of local white planters John Lloyd and Lafayette Dancy. There the refugees laid the foundation for an experiment in black self-determination: Freedom Hill. Union officials encouraged former slaves to return to the plantations and work for their old masters, but freedom offered more than that. The refugees sought the chance to control their own fortunes. The Freedom Hill location symbolized that opportunity: from the citadel overlooking the Tar, the Union army had announced its victory and the former slaves’ newly-recognized freedom. Here was the opportunity for black men and women to define their own independent future. Edgecombe County, like many areas throughout the South, was experiencing tremendous social upheaval after the Civil War. In 1860 just over 10,000 slaves, almost sixty percent of the total population, lived in the county. Most worked on tobacco farms and plantations. What would happen to them if they were freed? Who would cultivate the tobacco? Who would labor for the white landowners in their fields, homes and businesses if slavery was abolished? These were questions that the freed slaves and their former masters had to answer together. Most newly emancipated slaves were extremely poor and without food or clothing. However, the freed people realized that freedom was an opportunity for them to reconnect with family members from whom they had been separated during slavery. Freedom also meant controlling one’s own labor. And for black men, freedom would eventually mean the right to vote and hold political office. The separate black community of Freedom Hill, located at the core of one of the state’s largest slaveholding regions, also made social sense in the early stages of segregation and Jim Crow. Few whites wanted free black men and women to live among them, yet Freedom Hill supplied Tarboro and surrounding areas with a removed but dependable supply of laborers, sharecroppers, servants, and artisans. The community’s 1880 population totaled 379 people. The largest number of residents, fifty-five, were day laborers, laundresses and washerwomen. The community was also home to eight carpenters, seven blacksmiths, four grocers, three seamstresses and three brick masons. One of the carpenters, ex-slave Turner Prince, had lived in Freedom Hill since its founding; residents renamed the community in honor of him when it was incorporated in 1885. Princeville workers also capitalized on Tarboro’s growth at the turn of the century. Many found laboring jobs in the new fertilizer plant, textile mills and lumber industries across the Tar. It was, however, a bitter, violent time. Waves of white supremacy and economic depression threatened to swallow black communities throughout the south. White mobs drove black political and economic leaders and their allies from Wilmington, North Carolina in 1898. A mob of 10,000 whites torched entire black districts in Tulsa, Oklahoma in 1921. Such acts of racist terrorism were not unique during this period. Government actions — or inaction — seemed to condone this reign of terror. Laws banished African Americans to “colored-only” sections in railroad cars, restaurants, theaters and other public places. In 1896 the United States Supreme Court legalized the “separate but equal” doctrine with its decision in the case, Plessy v. Ferguson. But in several eastern counties of North Carolina, black residents were a majority, and in many of these locations, blacks exercised their political strength by electing black men to office. Princeville and Edgecombe County voters had elected eleven black men to the state legislature to serve fifteen terms from 1877 to 1890. Edgecombe County was part of the Second Congressional District, the famous “Black Second,” which sent to Congress two black representatives: James E. O’Hara of New Bern, from 1883 to 1887; and Henry Plummer Cheatham of Vance County, from 1889 to 1893. However, with the emergence of the white supremacist movement in the state, black voters and office holders were gradually excluded from the political process by legal or illegal methods. Literacy tests and poll taxes excluded poor and illiterate blacks from voting. Black voters were attacked or threatened by opposing whites; black ballots were altered or discarded altogether. George H. White, North Carolina’s last black representative in the U.S. Congress during this period, was removed from office in 1901 by a white electorate. Princeville, indeed, was a unique community. Although white supremacists had effectively ended black political participation at the federal and state level, black men continued to vote in municipal elections. Princeville established a public primary school in 1883 with black principals educated at northern institutions like Oberlin and Yale. By 1910 Princeville’s population had increased to 636, half of its adult residents could read and write, and the town contained a growing number of black merchants and artisans. In 1912 the primary school added a high school curriculum. Several Baptist and Methodist congregations also built churches in the first two decades of the twentieth century. Flooding, like the threat of white supremacy, has plagued Princeville since its settlement. Major floods occurred two years after the community’s founding and again in 1919, 1924, 1928, 1940 and 1958. Time after time, residents evacuated, came back and rebuilt. But some apparently tired of this periodic disruption of their lives. Between 1910 and 1923, the town’s population dwindled from 636 to 300. This coincided with a nationwide exodus of blacks out of the South; spurred by southern racism and perceived northern opportunities, many left for places like New York, Philadelphia and Baltimore. That trend continued until the 1950s. After a major flood in 1958, town officials approached the Army Corps of Engineers with a proposal to build a dam. A three-mile long, four million dollar earthen levee along the south bank of the Tar River was finally completed in 1967. The dike could accommodate thirty-seven feet of water; since flood waters had never exceeded thirty-three feet, people felt safe at last from the Tar. Life was still difficult after the construction of the levee, but living conditions were modernized. In the 1970s, Princeville got water and sewer systems and paved all the roads in town. Throughout the ’70s and ’80s, the town annexed several surrounding areas in an effort to increase revenue. By the 1990s, Princeville was still a tiny community of about 2,100 residents, but it appeared stable. Just before the 1999 flood, the town was home to thirty-seven businesses, including auto mechanic and body shops, beauty parlors, barber shops, a lawyer’s office, truck stops, a restaurant, and car dealers. Town officials were trying to secure a post office and bank. The town was also trying to acquire ownership of the cemetery; the lots are now owned by individuals, many of whom have moved away and don’t often visit. Princeville’s town hall, originally built as a schoolhouse in the 1920s, was badly damaged by the recent flood, and past floods destroyed many other older structures. In stark contrast to Princeville is nearby Tarboro, with its forty-five-block historic district of Victorian homes and Queen Anne cottages. Princeville, for much of its history, has been so concerned about survival that historic preservation has been almost impossible. Maybe the recent spotlight on Princeville will encourage the public (and potential funders) that the town is worth preserving. Back in the cemetery, the dead are still silent. But signs of life are everywhere in Princeville, especially in the churches. A small, white wooden church — hushed when we arrived that early Sunday morning — sits opposite the cemetery across Highway 258. While our team from NCCU was busy trying to restore voices in the community of the dead, the congregation was rejoicing. The joyful noises they made drifted over the road, an appropriate soundtrack for our meager efforts. Exactly one year had passed since the immense flood. The resilient, historic little town had survived, and residents were giving praise to their Creator for guiding them through the last 115 years.